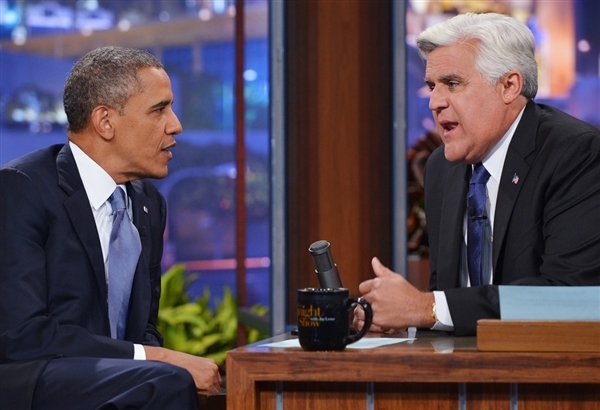 Armed with some quips and the latest version of his endless campaign’s stump speech, President Obama appeared on Jay Leno’s Tonight Show last night. His appearance on the late night talk/comedy program represented the first time he has publicly spoken about the al Qaeda terrorist threat since the warnings were first issued at the end of last week. The POTUS urged Americans to continue to “live our lives” that it’s important not to let terrorists “shut us down” over fears of violence. The President and Leno also discussed a range of topics from Obamacare to Trayvon Martin, to Edward Snowden’s Russian sanctuary, but what he discussed is not as important as where it was discussed. This country was forced to close all of Middle East embassies because of a terrorist threat, ordered our citizens to cut and run out of Yemen, one of our key “allies” in the Middle East-Egypt is in crises (and the State Department hasn’t decided what to call it), the economy is still in shambles, his signature bill Obamacare is imploding, the deficit is nearing $17 trillion dollars, and there is the threat of a government shut down (and let us not forget there are more than a few not-so-phony scandals his administration is dealing with), but instead of trying to “act Presidential” Barack Obama flies to Los Angeles to do a night-time talk show!?!?! When Great Britain was under attack by the Nazi’s did Winston Churchill go on the Benny Hill Show? Did Truman announce we were going into Korea by doing a sketch with Sid Caesar on “Your Show of Shows?” When all of America was huddling by their TV sets worrying about a possible nuclear war during the Cuban Missile Crisis did JFK fly to NY to appear on the Jack Parr Hosted Tonight Show? NO! Obama’s appearance last night was just another indication of the disdain he has for his office, the people of the United States and his responsibility as a leader! And before anyone points out that Clinton played the Sax on Arsenio Hall and Nixon was on Laugh-In to deliver the line “Sock it To Me,” remember neither of those presidents had been elected to their first term when they made their famous appearances. There is always a dichotomy in the American Presidency. On one hand we want our presidents to be approachable “regular” people… after all this country was created to get away from an oppressive king. On the other hand, in times of crises we want our presidents to be a “superman” and rise above us–to act “presidential” and lead.